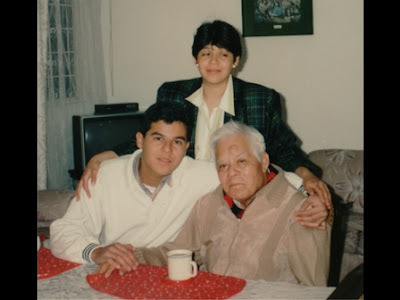 Pictured: My grandfather Jose with me and sister Mariel, late 1980s. One of the most powerful life lessons I’ve learned came from the kitchen, and my grandfather quite accidentally taught it. It must have been 1988 or 1989. I was in high school then, and came back home daily from school to an empty condo in Mexico City. My mom worked until the evening and I had to cook for myself every day, even though I didn’t know how to. On one occasion my grandfather, Jose, came over to wait for my dad. They were going to a doctor’s appointment. I was happy that he was there. He was a pleasing old man, gentle, warm, and always in a good mood. In my eagerness to please him, I offered him some rice that I was about to cook. He said that he was hungry too and that he would eat with me. Being only about sixteen and having cooked rice only once or twice, I proceeded to attempt steaming it on the stove. I must have applied too much heat and not enough water, because after a few minutes the whole condo was filled with smoke. My rice was a smelly mess of hard-burned grains on the bottom and half-cooked grains on the top. In just a few words he showed me his love and acceptance. He did not judge me or criticize me. He was not concerned about his food. He was more concerned about me not getting in trouble. And that selflessness has stayed with me ever since. He passed away a decade ago at the age of 91, yet I always remember with love and admiration. With that kind of acceptance I was able to grow up with confidence. I could screw up and still be OK, after all.